I find it very interesting to see a resurgence in the 45 RPM single. 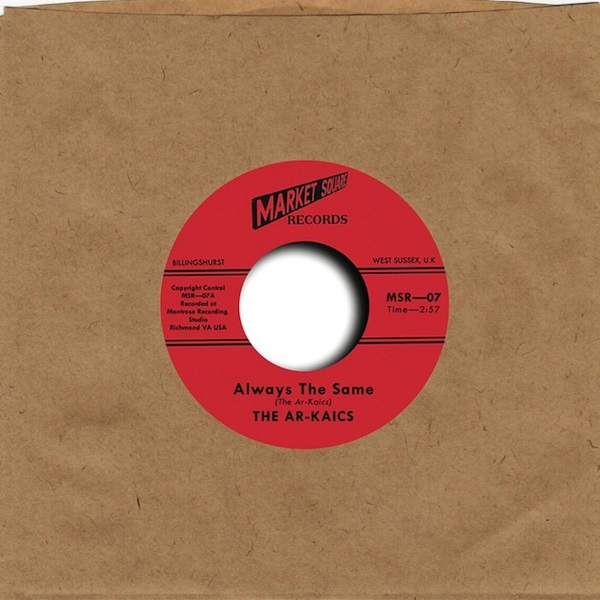 One of the latest is this little 7-inch that comes housed in a brown paper sleeve from the Richmond-based garage-psych band The Ar-Kaics, the first new music since their full-length album released in August 2014. The A-Side contains the three-minute “Always the Same” with a heavy garage beat and gutsy guitar. It is a slow and relentless song conjuring retro-musical images of The Troggs, The Pretty Things, and The Seeds. The flip side is the four-minute “Let Me In,” a moodier and mellower song that is a confused lament to misunderstood love submerged by trippy waves of tremolo feedback. Their singer Kevin Longendyke has a great edgy voice, kind of like a young Roky Erikson. I wish that I could write more, but with only two songs, there is not much left to say — try to score a copy of this limited edition of 300 copies.